a Swap we have going on in our Gecko Galz Yahoo Paper crafting group. I started out using a Digital Collage Sheet that I designed. You can find them in my Etsy store here. One of the great things about this collage sheet is the versatility of it. 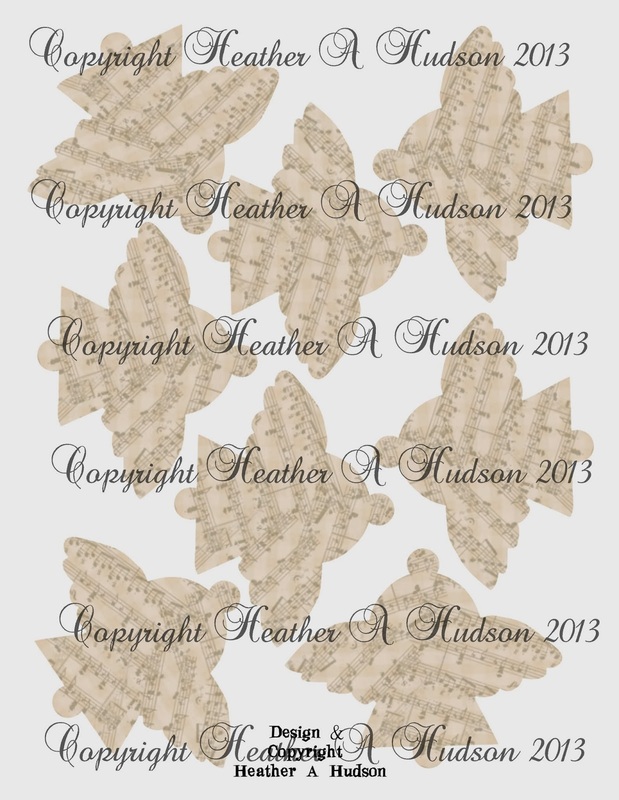 You can print out page one and page two, and create 4 Angel ornaments that you can design both the front and the back. They could look like the ornaments below. Or you can print out the first sheet, and two of the second sheet, and you can make 8 ornaments that just have the beautiful music backing. This space can be used for journaling a sweet Christmas wish! Your ornament backs would look like the one to the left in the photo below. Bonnie at Really Reasonable Ribbon has a Black Friday sale going on, you can find the coupon codes here. Good opportunity to get yourself some ribbons and trims!! As a little After Thanksgiving Day goodie. 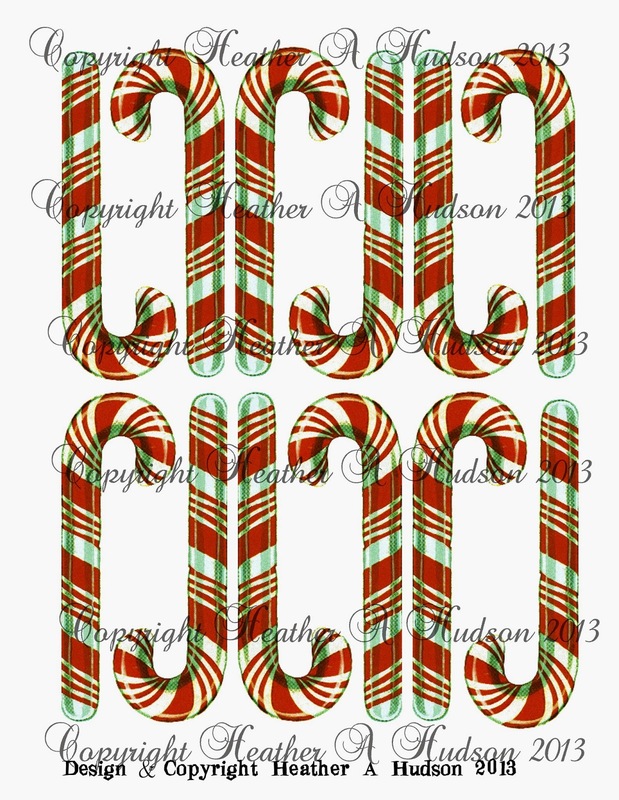 Anyone who purchases my new Advent Calendar Digital Collage sheet set or spends $20 in my etsy shop, will get my plain Candy Canes digital collage sheet for free this weekend. 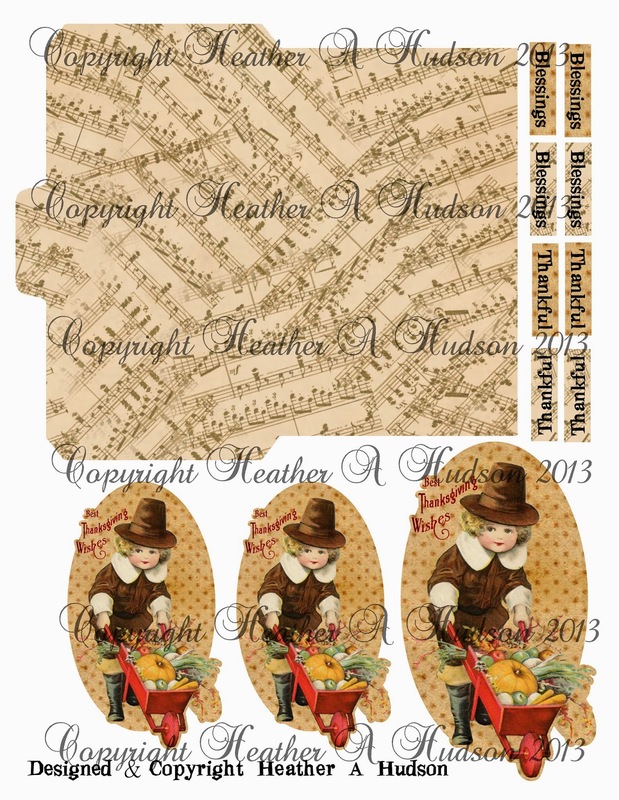 Here is one tag that I made using my New Advent Calendar Tag/Pillow Box Digital Collage Sheet Set. I will have a tutorial on my blog tomorrow of how to create the tag!! (creating gifts and knocking them off my "to do" list, and making some to decorate the trees). Karen offers free images for you to play with!! I am guessing that many of you, like myself are preparing for Thanksgiving! I have been working on some collage sheets lately, and I just wanted to take a moment to share with you two sets that I will be using the next couple days. 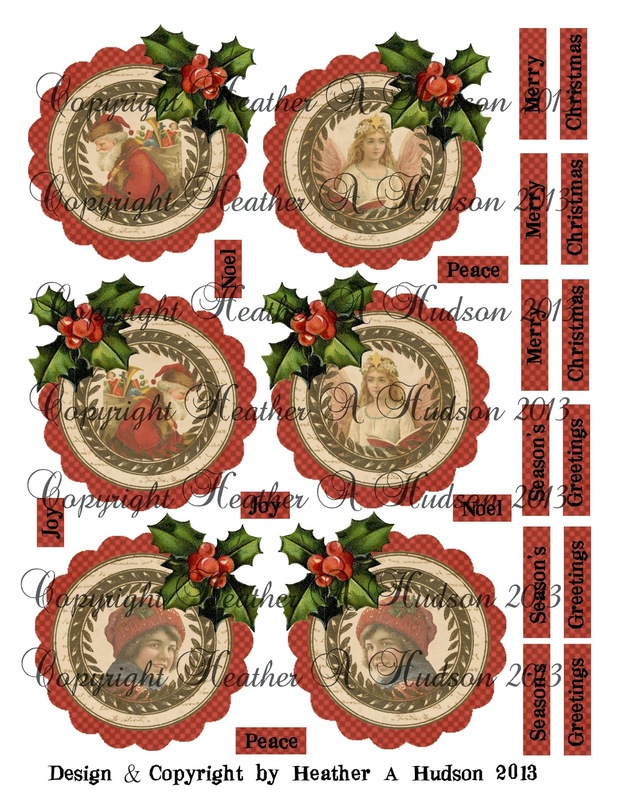 They are my Vintage inspired Christmas Advent Calendar Sheets. 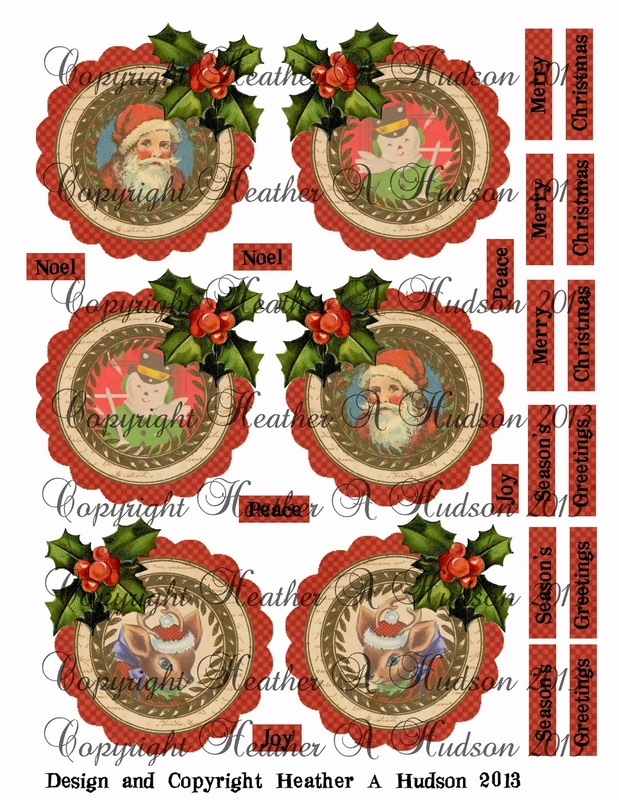 I used images from the Graphic Fairy, the Santa below is one I restored from my friend Sandi, and the cute little snowman on sheet 4 is from my friend Jess. Let me show you one of the projects from the sheets first. I am soooo excited about my Collage sheets! You can make something super beautiful by just adding a few embellishments!! 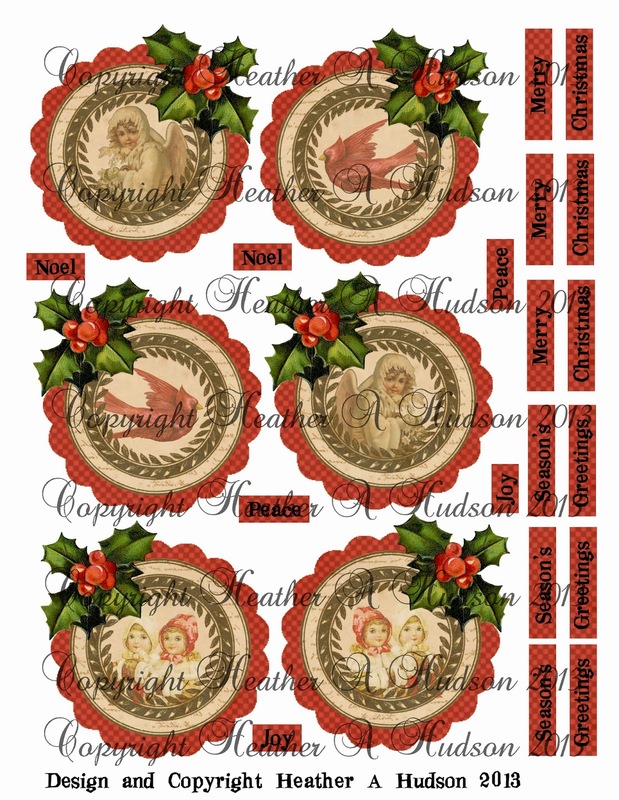 Vintage Christmas Classic Countdown Advent Calendar Pillow Box, Fancy tag or Easy Tag Basic Shapes Ornaments Digital Collage Sheet. 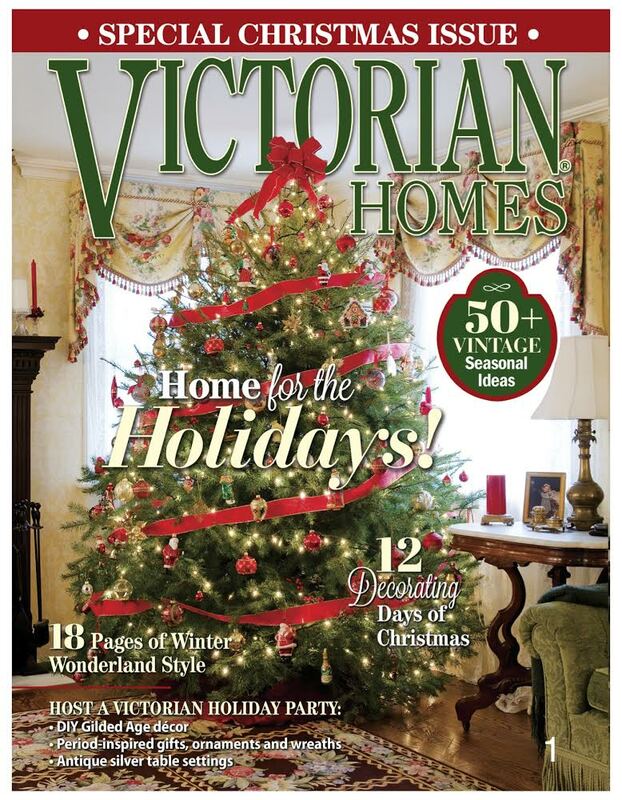 The first page is a pillow box template filled with a beautiful Christmas pattern that I created. It has the score lines and cut lines visible, but they easily cover up with Vintage Photo or Walnut distress inks from Ranger. I will be doing a tutorial soon, showing you how to put the box together. Gives you two options. 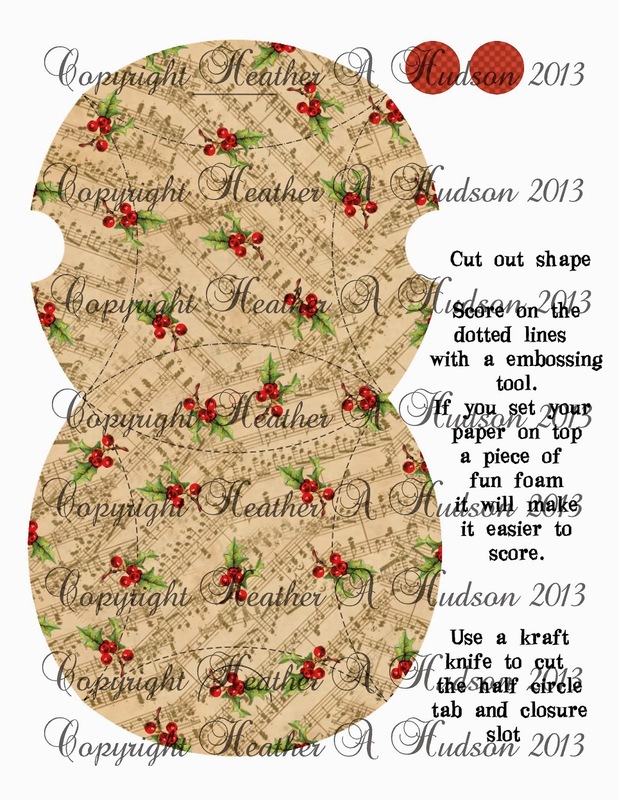 A fancy shaped tag/Tree ornament, like the one I used above, or a more shaped tag/Tree ornament. 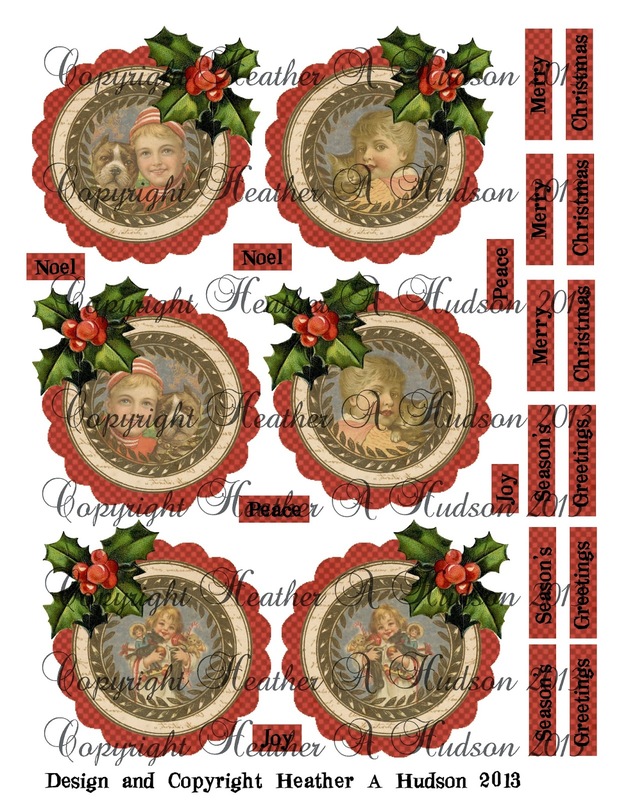 The papers have been flipped, so there is a tag/Ornament front and tag/Ornament back. The smaller round pieces are to be used for hole re-enforcers. 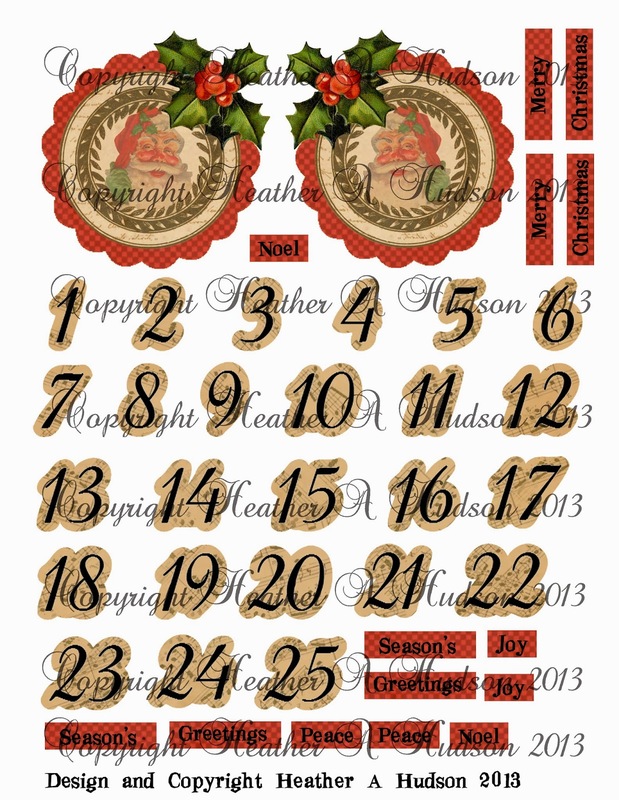 So, you can create an Advent calendar, or ornaments for the tree, tags for gifts...your choice!! This collage set comes with 5 pages. Fits great on my tags or the pillow box above! They could also be used on cards! Each sheet has focals, and text boxes, so you can choose what goes on each box, tag or card. I have outlined the numbers so that they will stand out on your project, and if you don't have a digital cutter, they still will be easy to cut out. Back to the tag I am sharing today. I used lots of yummy goodies from Really Reasonable Ribbon and of course Glittered it up for the Holidays with my Art Glitter Stash! I used a Vintage Bonanza Button, peppermint baker's twine, red satin, red dots, crochet lace as well as Juliet lace, Deep Ivory Mulberry Roses, a red mulberry rose and Moss leaves. You can see some of them nice and up close in the photos below. Close up of the right. I used Art Glitter Designer dries clear Glue & Ultra fine Metal Tip to add glue to my Advent tag. #208 Fauna was used on my candy cane. #79 Black was used on my number 20, #160 Rose Gold goes around the outside of my tag shape and the #20 shape, #349 Garnet was used on the Candy cane, red scallop, text boxes, holly berries, hole enforcer and candy cane. #196 Lion's Mane was used on the ivory circle and #295 Ensalada was used on the holly leaves. I topped off my tag with a beautiful Red Seam Binding bow made with my Bow it all Tool! I used the red diagonal trim as my hanger. One last look at my finished piece. I hope you have a wonderful Thanksgiving!! Please check back soon, because I will be doing the pillow box and a tutorial of how to use my sheets! 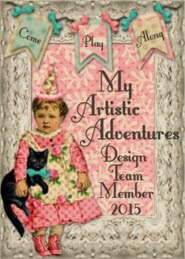 I will be sharing with Brag Monday at The Graphics Fairy! 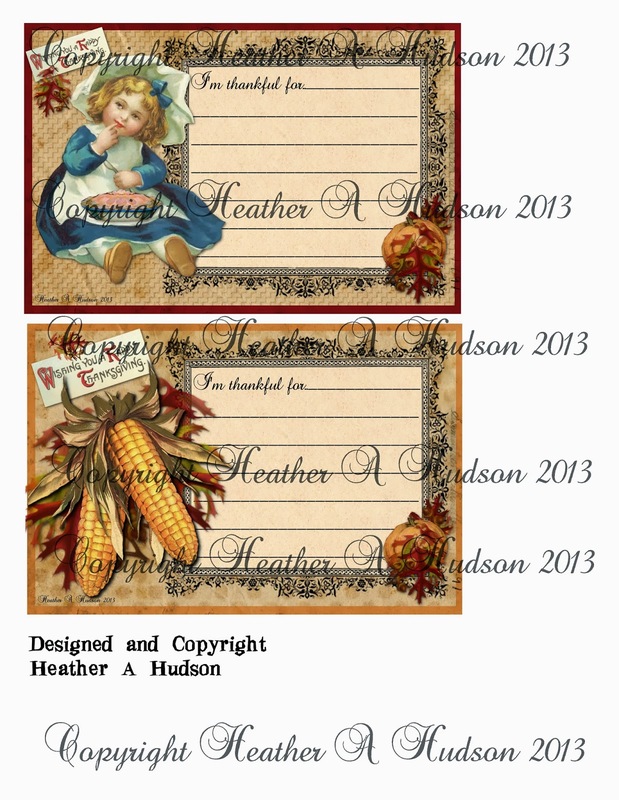 Vintage Thanksgiving "Thankful Memories" Card set. 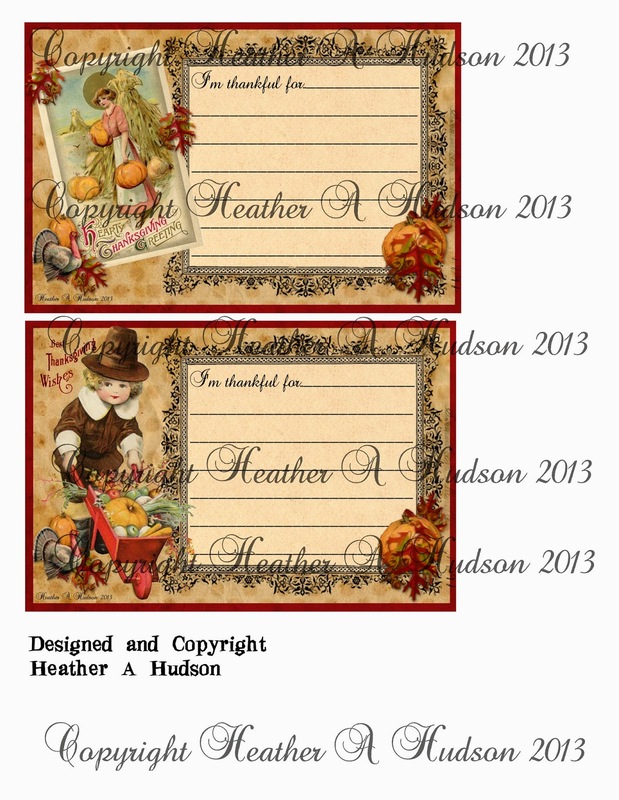 I created these Thankful cards using some images I found from the Graphics fairy. The idea behind the cards was to create a new family tradition. Each member who will be attending our Thanksgiving Dinner will receive one of the cards to write what they are Thankful for on. Then when Dinner conversation starts, and we go around the table asking what everyone is thankful for, people can refer to their cards. The great thing about writing it all down, is that the cards can be kept and revisited in years to come! All I know is that my boys and my 4 nephews all love to share what they are thankful for, and they are young adults and teens now. So it is nice to have their thoughts on paper! If you would like to start this tradition with your family and don't have time to create some cards of your own, you can find my collage sheet set in my etsy here. You will receive 4 sheets. 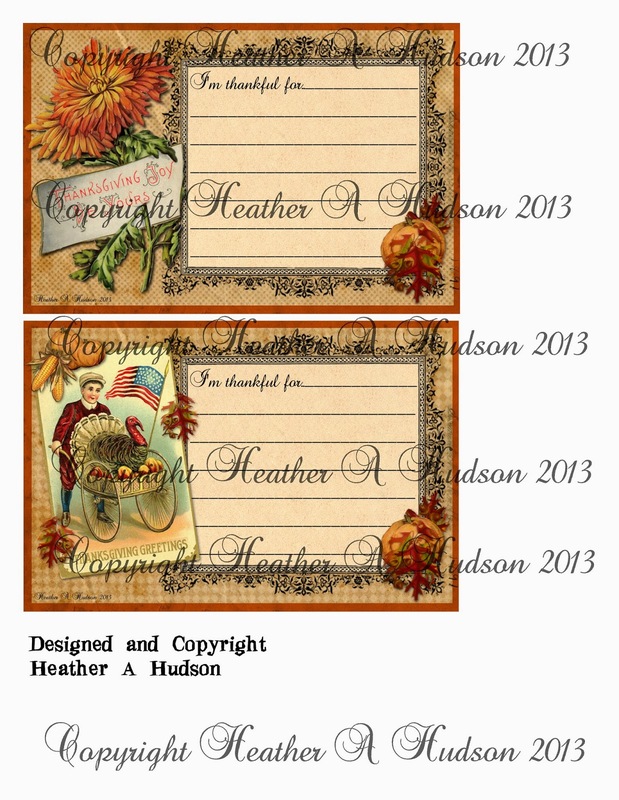 (notice there are two extra smaller focal images, that you can use on cards). Here is a look of how it I put mine together. First I printed out a few sheets of music background and one dots background papers. Then I put them back into my printer so that I could print out my sheets on the other side. I used my MTC program and my Black Cat cougar to cut them all out. Then I inked the edges with Ranger's Vintage Photo. Here are the backs, I recommend doing just the dots type paper, because it will be kind of hard to read text that is on the music paper. Lucky for me, my kiddos write dark, and I will give them a sharpie. I did ink both sides. Here is how it looks when you fold over your pocket tabs, and then glue them in place. The cards fit inside nicely. Next I added some Tombow foam tabs to elevate my focal image. I also added my "blessings" text box to my tab. I placed a piece of Really Reasonable Ribbon vintage looking Edna crochet trim across the front. I used my new Bow it All to with my Gold Organza, both from Really Reasonable Ribbon to create my fabby bow!! Next I used my Art Glitter Designer dries clear Glue & Ultra fine Metal Tip to apply some glue and hold down my bow ends. You can place them artistically on your piece, or clip them shorter so you don't have to play around with them. I added some of my favorite Really Reasonable Ribbon Deep Ivory Mulberry Roses to help hold my ribbon in place. I did the same thing with the other tie. Next I used my Art Glitter Designer dries clear Glue & Ultra fine Metal Tip to apply glue through out my piece and I added glitter. #300 Camel was added to the hat, coat and pants. #236 Clementine was added to the some of the veggies in the wagon, #208 Fauna was added to the collar and cuffs, #295 Ensalada was added to the greenery, #196 Lion's Mane was added to the edge of focal image oval, and boot cuff. #91 Orange Crush was added to my pumpkin, #349 Garnet was added to the wheel barrow. I also cut two piece of Gold Shimmer Satin which I tucked in under my focal piece on top of the crochet lace. Next I tied my cards with a piece of Moss green Micro gingham, added a cafe latte button which was tied with Brown Sugar baker's twine. I also added my text box off to the left of my focal image. Securing the left side of it with a pop dot and the right side just glued down on top of my focal image. #196 Lion's Mane glitter was used on both text boxes, and #160 Rose Gold was added to the outer pocket edges. The bow it all really makes beautiful bows!! You can see it on my Youtube channel here. I would love to hear about your Family's Thanksgiving Traditions!